Lockheed F-104 Starfighter - 1/48 - NOVIDADE! The Lockheed F-104 Starfighter, with its slender fuselage and the very little wing surface, has been for a lot of years the reference fighter of the Aeronautica Militare Italiana. Thanks to the thrust of its General Electric J79 afterburning turbojet engine, it could exceed Mach 2,2 with an excellent rate of climb. During the years of its operational service, several fighter squadrons of Aeronautica Militare, realized unique commemorative livery, with a strong an amazing visual impact. 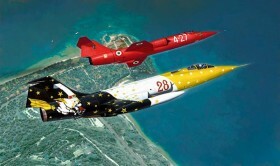 The adoption of particular liverys was used both for the celebrations of the fighter squadron flying activity and history, such as the F-104G Streghe (Witches) made in 1989 by the 3° Stormo located in Verona Villafranca using the colors of the 28° Gruppo, or to commemorate important events on the mass culture. About this second category one of the best known is the fantastic F-104G “Rosso 27”, made by the 4° Stormo 20° Gruppo, located in Grosseto, that adopted the Ferrari Red livery and the number 27 in memory of the Canadian F1 champion Gilles Villeneuve. Donated by Aeronautica Militare to Ferrari the “Rosso 27” is the "gate guardian" at the Fiorano track.